It's 90 degrees today in North Carolina, so I'm still not quite ready to pull out my pumpkins, but I want Autumn to be here! So I've added a few more fallish touches to the front porch. My chrysanthemums aren't in full bloom yet, but I like having a basket of them right here by the front door. A wicker jug and a old tool tote full of pine cones round out the decor by the door. 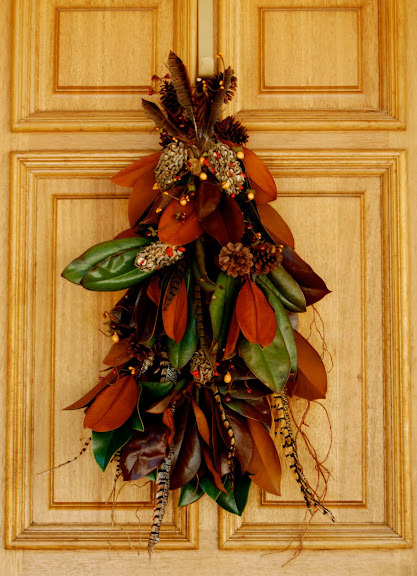 Inspired by Pottery Barn's feather pomegranate swag, I made a swag for my front door with magnolia branches, magnolia seed pods, pine cones, and feathers. Except for the wear and tear on my hands, and provided I don't have to seek medical attention for my glue gun burns, my swag was much less expensive than Pottery Barn's. What do you think? The sitting area already got a touch of fall with the autumn leaf pillows I made. I added some mums and fallish garland to the lamp table. These mums are in full bloom: they're silk flowers from Dollar Tree. The little sign in front of the planter says "Welcome." It doesn't show up very well in the photo, but you can see it just fine in real life. I want people to feel welcome to hang out on my porch! Now when the weather finally turns crisp and cool, I'll be ready to greet it! What are you doing to welcome Autumn? and Show and Share Day at Just a Girl. You have the most amazing front door and porch ever! Your fall touches look really lovely. Looks amazing, girl! I had a tool box once like that on my front porch and someone walked off with it! I was sad. Anyway the porch looks wonderful and I love your swag! Richella, I am in love with your swag! It's gorgeous! I looooove Magnolia leaves. Your leaf pillows look awesome too! Love those! You are too good!! I love it!! I love the word "chrysanthemum." I learned to spell it watching "Anne of Green Gables" when I was 10. "c-h-r-y-s-a-n-t-h-E-m-u-m." Take that, Gilbert Blythe! I enjoyed looking. I love the magnolia swag. The tool tote reminds me of the one my dad had years ago. Hi Richella! Thanks for your well wishes. Your porch is just gorgeous! I fantasize about serving lemonade on just such a porch one day. I love the faux mum idea. I'm definitely picking some up at the dollar store. My hubby will be so glad I'm not wasting money on flowers I'll eventually kill! Your front porch and sitting area are just beautiful. Love the swag on your front door. I would love to take a nap on your porch. I've been getting my Fall stuff out too AND I made a pillow like yours :) Come by and see it. I want to get some more felt to make a green or brown one too. I love your idea, thanks so much for sharing it. I didn't realize you were so crafty! I love those leaf pillows - very very cute! Your front door looks beautiful! I am in love with the swag and that jug. The porch looks great too. pretty entrance...I especially like your lanterns! your house always looks so welcoming... and someday i just know i am going to be knocking on that beautiful front door! Hi Richella! Oh, your front door is so beautiful and I love all of your fallen touches! Just gorgeous! Your patio is more beautiful than most living rooms! I absolutely love this and want to copy your swag for my own door. Your house looks ready for fall, even if it is 90 degrees outside. Your home is beautiful. I just want to come sit on your porch and have a glass of tea. Visiting from CSI project. Come check me out if you'd like! Love, love, LOVE the swag! You have the prettiest home! Richella, I think your swag is beyond mahvelous!! I love it. I love magnolia leaves anyway. They have such great color. I love what you used with them. I am so jealous of that porch and the pillows are so cute. Everything is so beautiful. I love your swag and your door is beautiful. Everything looks great. I know how you feel about the weather, I live in Alabama and while it has cooled off some, it is still hot. However, like you, I want Autumn to hurry and get here so I have started putting out some of my fall decorations and plan to do more this weekend. I love the swag you made for your front door. I love the swag! I love magnolia leaves. That was a very good idea. Just beautiful! I love that swag! Beautiful job! Oh. My. Word!!! This is gorgeous! Tweet worthy I say! Thanks for sharing it with me. Sigh. I think I could take a nap out there. 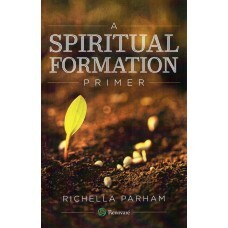 Please tell me you do your devotionals out there! Perfect place! Your porch is SO BEAUTIFUL!!! Gorgeous, Richella!! Truly, truly so pretty. I officially have porch envy. :) Thanks for all your kind words, you're such a sweetheart.